I was thrilled to log on to the Bundaberg News Mail website last Friday and read about 100 of our students who are about to take to the skies as part of CQUniversity’s new aviation course. As I have mentioned on a number of occasions, flying is something close to my heart, and something I do as much as I possibly can. In fact my own plane, a Jabiru J230C, was manufactured in Bundaberg. It seems fitting that these CQUniversity students are learning the ropes in Bundaberg as it was here that one of Australia’s true aviation pioneers was born and raised. Bert Hinkler, undoubtedly Australia’s greatest aviator, developed his interest in flying at a young age, observing the way ibis could fly at a lake near his school. The CQUniversity aviation course is an innovative and exciting program for CQUniversity, but it is particularly fitting that it is being delivered in Bundaberg, where Bert Hinkler still remains a favourite son. Congratulations to these students on pursuing their passion! I have no doubt you will all feel right at home in the cockpit and love every second of taking to the sky. 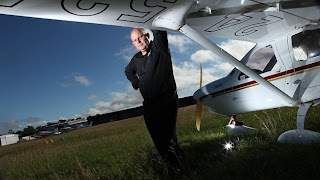 Below is a picture of me with my plane taken last year for The Australian by Adam Knott.